When you go to the movies today, what movies you go see may force you to ask yourself "Where's the beef?" Today there are movies with wonderful special effects, grand stars, and no heart. Movies that are visual feasts that wow you, but leave you feeling empty on the inside. While people may consider this a recent trend with all the advances in technology, the truth is these sort of movies have been around for years, and the 1956 Best Picture winner "Around The World In 80 Days" is living proof of this. 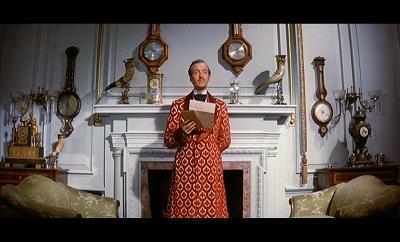 The story for "Around The World In 80 Days" takes up a whole twenty minutes of the movie. Several gentlemen hear of a bank being robbed by a thief who has fled the country, which leads to a discussion on whether or not he could successfully get away from the law. Phileas Fogg says that technology has advanced so much that if the thief were resourceful enough he could circle the world in exactly 80 days. The other gentlemen laugh and say it can't be done, so Fogg bets them 20,000 pounds that he personally could travel around the world in 80 days. The gentlemen accept his bet, and with his assistant Passepartout sets out to circle the globe using whatever means necessary . A subplot involving a police man chasing Fogg due to a suspicion that he might have stolen some money, as well as a subplot where Fogg and Passepartout save an Indian princess (played by a young Shirley MacLaine in makeup) take place during this movie, but they are all second nature to what the movie is really about: Exotic locations and wondrous sights to see. 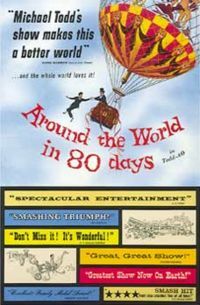 Now, before we get into the meat (or lack therefor) of the movie, it should be noted that "Around The World In 80 Days" was not made with the intention of being good. Oh I'm sure producer Michael Todd (who gets his name above the title over the director) was pleased that people thought it was good, but the intention was not to make something that would be digested slowly. Michael Todd was tired of movies that were all talk and no action, and he wanted people to feel like a participant in the movie. Therefore he created a new camera called Todd-AO, which would later be known as 70mm Cinescope. "Around The World In 80 Days" was not the first widescreen film (that was "The Robe") but made the biggest impression on the world. Ingeniously, the movie's opening (with a prolog by Edward R. Murrow) begins in the standard 35mm full screen mode, which was the shape of a TV screen. After a lengthy history of science and travel, the screen widens up to reveal the 70mm Todd-AO format. If you saw this movie in the theaters in 1956, this is where the curtain would pull open to cover the whole wall of the theater, therefor making the movie as immersive as possible. But making the picture bigger was only the beginning. Now Todd was going to make it so that audiences would be taken where they never went before. In a hot air balloon ride. To Spain to watch a bull fight. On a train where savage Indians are raiding the train, which results in a epic gun fight with the main characters fighting for their lives. Everything that could thrill audiences were thrown into this movie, as well as a bunch of cameo appearances from famous stars such as Buster Keaton, Frank Sinatra, and Trevor Howard. 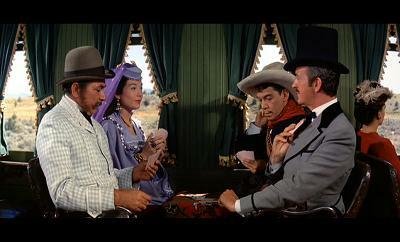 In fact, this is the first movie where the term "cameo appearance" was coined in the first place. There are more then twenty cameo appearances in "Around The World In 80 Days," though most of the people don't say anything, and where there just to get a reaction from the audience (Example: A salon player looks up from his piano long enough for us to see it's Frank Sinatra and then puts his head back down). Considering this film pioneered so many techniques we take for granted now, I can't say I completely hate this film. 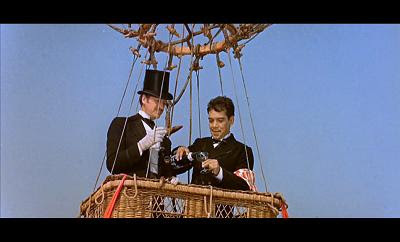 That said, "Around The World In 80 Days" is the dullest Best Picture winner you are most likely ever going to see. Not bad, dull . For all the techniques this film created, it is a shame the story itself is not more interesting. I don't know whether or not this is the fault of the source material, the film makers, or both. Certainly science has evolved so much in the past few years, that the idea you would need 80 days to circle the globe is absurd, you could travel it in less then a few days (and that's if you're being lazy). 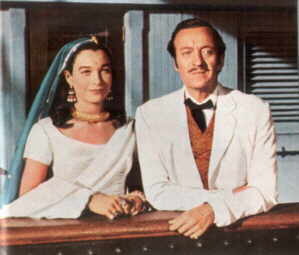 Even at the time of this films release it was easy to travel the world in half the time of this film, so the novelty of the story is long gone. So yes, the source material doesn't provide much suspense or imagination anymore, but worse was the film makers insistence of being too much in love with their own techniques. So intent are the film makers to make the audiences feel like they are viewing the world, the movie stalls several times in the movie, becoming tedious along the way. I mentioned that the storyline takes up about twenty minutes of the time in this movie, but the movie itself is more then three hours long. So what is it you are actually watching for those three hours? Well, everything but story. The prolog with Edward R. Murrow is a good example of how much time the film wastes. Aside from the introduction to the Todd-AO format, this introduction has a documentary feel that has nothing to do with the movie. Then there's the fact that when you consider that Fogg and Passepartout are in a race it's very odd that they spend so much time lounging around. They go to Spain and spend almost a half hour fighting a bull. A balloon flight takes fifteen minutes. Indians chase the train for twenty. Shots of the sky and sea easily amount to more then an hours worth of film. And it just goes on and on, with these characters saying absolutely nothing of interest. 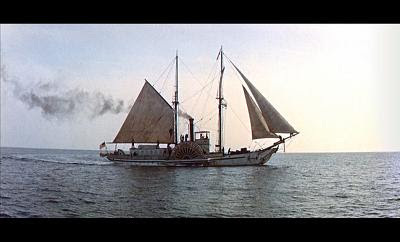 During a boat scene there is about ten minutes of crew members throwing wood into the steam engine to make a boat go faster. It helps that Fogg has enough money to buy boats, trains, and whatever else he needs to win the race. I'm not exactly sure how much 20,000 pounds was worth back in 1956, but it seems like the cost of the race far outweighs the reward for winning it. This movie won five Academy Awards. It's saying something that film did not win Best Director or was even nominated for any acting awards. This is a technical film through and through. The problem with technical films winning Oscars for Best Picture is that the excitement of them wear down pretty fast. While movies like "Ben-Hur," "The Lord of the Rings: The Return of the King," and "Amadeus" were all very technical movies, they also had the story and characters to back up the movie when the visuals became outdated. "Around The World In 80 Days" is easily one of the worst Best Picture winners. It's not terrible, but it's painfully dull, it's so long it's maddening, and you don't ever really feel like your joining a race considering how many side trips are taken that wastes time. If there's a Best Picture winner you have to chose to not see, "Around The World In 80 Days" should be high on the list of considerations. Parents have nothing to worry about, this movie is suitable for all ages.